Heat oven to 350°. Lightly grease bottom only of loaf pan, 9x5x3 or 8 1/2x4 1/2x2 1/2 inches, with shortening or spray bottom with cooking spray. Stir together flour, cheese, sugar, baking powder, baking soda and salt in medium bowl. Stir in remaining ingredients just until moistened (batter will be lumpy). Spread in pan. Bake 35 to 45 minutes or until golden brown and toothpick inserted in center comes out clean. Cool 5 minutes; run knife around edges of pan to loosen. Remove from pan to wire rack. Cool 30 minutes before slicing. If you don't have buttermilk on hand, use 1 tablespoon lemon juice or white vinegar plus enough milk to equal 1 cup. 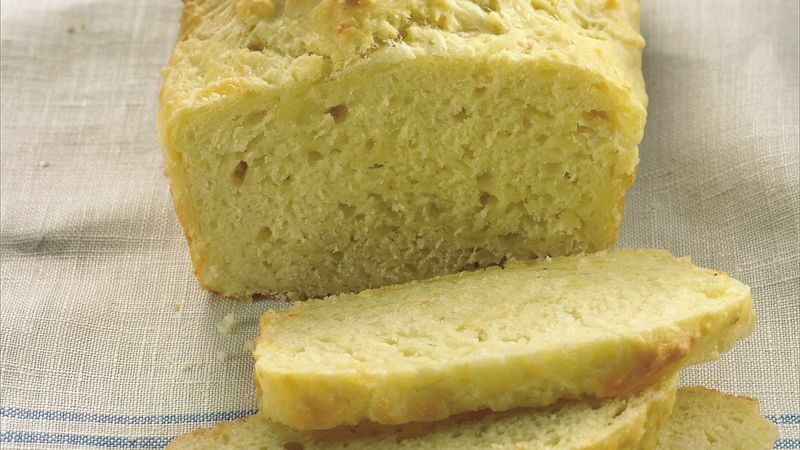 The great thing about quick breads is they are so quick to fix. They don't need a lot of mixing, just enough so the wet and dry ingredients are combined. Even though the batter may look lumpy, when it's baked, the bread will be light and tender.